Those interested in working with the same patients day in and day out might find themselves looking at what an ICU nurse does. Also known as critical care nurses, these men and women work for intensive care units in hospitals and other medical facilities. They provide immediate support in emergency situations and daily care for long-term patients. ICU nurses perform a variety of tasks every day while on the job. Assessing the situation is just one of the tasks that ICU nurses do every day. Intensive care units often feature patients recovering from heart attacks and other serious medical conditions, and they need to remain on top of each situation. Every time that they come to work, they need to look at each patient, note any changes issued by doctors in terms of medications and other treatments and keep track of the care they need to give their patients. Assessing the situation helps them decide when to contact a doctor for help and how to give patients the level of care they need. what an ICU nurse does, you’ll find that these nurses provide both emergency and long-term care. Emergency situations can arise at any moment and include a patient going into cardiac arrest or a patient slipping into a coma. ICU nurses must know how to call a code and perform tasks that might save the patient’s life. They also handle long-term care as it relates to patients residing on the ICU floor until they can go home or into a nursing home. 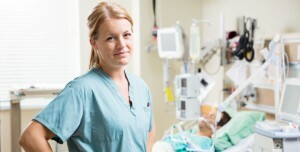 According to the American Association of Critical-Care Nurses, an ICU nurse is essentially a liaison. That nurse serves as a patient advocate and the connection between the patient to his or her medical professionals. They may also serve as liaisons between the doctors and nurses working on the case with the patient and the patient’s family. ICU nurses inform patients of any upcoming changes to their status, including any new medications they need to take and new treatments prescribed by the doctor. They ensure that the family and loved ones of the patient remain on top of the situation and that they understand both the condition and any risks involved with new treatments. Those looking at what an ICU nurse does will also find out that these nurses perform daily care and simple tasks for patients. A patient recovering from a heart attack will often need help eating and walking to the bathroom, while a coma patient might need sponge baths and their IV bags changed. Nurses will also take the vital statistics of patients every few hours or as recommended by a doctor. This includes checking the patient’s blood pressure and heart rate, and it may also include checking cholesterol levels or blood sugar levels. The nurses use this information to keep doctors updated on a patient’s condition. ICU nurses work with patients in critical condition, including those in comas, heart attack patients and car accidents. When checking out what an ICU nurse does, you’ll learn that these men and women check vital statistics and offer daily care for patients, but that they also act as liaisons and look out for the best interests of their patients.